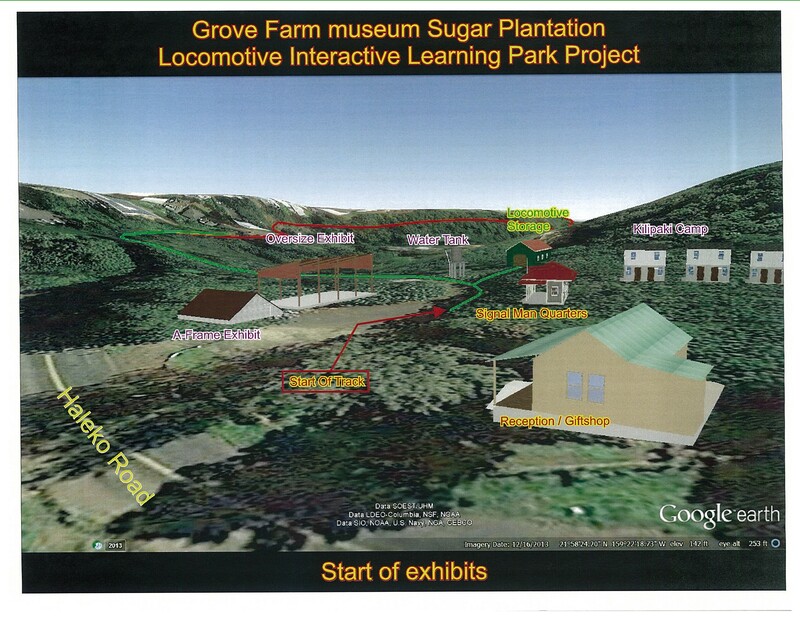 Waioli Corporation, dba Grove Farm museum, is expanding its Sugar Plantation Interactive Locomotive Learning Park, which currently “fires-up” the train on the second Thursday of each month. This project offers an opportunity to protect and share a large part of the distinctive Kauai sugar history as well as collect and archive surviving first hand personal stories as a memorial to the multi-cultural plantation laborers’. The Learning Park will come to life through interactive exhibits and actual use of the large plantation equipment collected throughout the plantation years as well as viewing historic films showing them in operation. We were thrilled when in 2017 the Hawaii State Legislature awarded a Grant in Aid for Phase I of the project $550,000.00! This funding will provide for the laying of track on the final 3500 feet of the mile-long historic steam train route, which includes the purchase and installation of the ballast, and the planning, installation of infrastructures for the construction of crucial reception/restroom facilities. The full project will require capital improvement funds in the amount of $2,000,000.00 over a five-year period to complete. Future requests to the State Legislature will be made in 2020 and 2022. Below is a portion of the Grant in Aid application, which describes the goals and implementation plans specific to the grant request as well as other exhibits scheduled for this ambitious project. Waioli Corporation, dba Grove Farm museum, a non-profit organization managed and operated by community volunteers entrusted to preserve and conserve still thriving living island cultural activities and community lifestyles. It stewards surviving ancient Hawaiian agricultural sites, missionary and plantation buildings, collections and histories and lands that support native wildlife and cultural activities. Tours of the Waioli Mission House in Hanalei and the Grove Farm sugar plantation homestead museum and steam locomotive rides in Lihue, are provided as “edutainment” to students, researchers and visitors to the island. A brief description of an organization that can trace its history back to 1834 is hard to imagine, but this is Waioli Corporation in a nutshell. The goal of this First Phase $750,000.00 request is to fund the laying of track on the final 3500 feet of the mile-long historic steam train route; the planning, installation of infrastructures and construction of crucial reception/restroom facilities as well as the restoration of the much needed Lihue Plantation original water tank. Also this year, donations from the private sector are funding the construction of a rail line equipment storage building. The Second Phase, which will begin in 2020, includes the rebuilding of Switchmen’s quarters for exhibit space, a protective cane cars storage shed, and clearing and installation of mile-long exhibit of sugar cane varieties and irrigation. The Third Phase, which will begin in 2022, includes the construction of a shed for oversized plantation machinery, and a 1850s A-Frame plantation structure. The Hawaiian Islands’ communities believe and have expressed that the sugar history of the islands cannot be allowed to disappear. With the closing of the last sugar plantation in Hawaii, the purpose served is to actively exhibit the people, farming methods and brilliant innovations of 150 years of sugar cultivation that supported the islands’ economies while creating a multi-cultural community. The target population to be served are local and visiting students and scholars. The exhibit will have something for everyone, from the local statewide community whose family members worked on the plantations to the various visitor groups, such as Cultural tourism, Ecotourism, Edutourism, Geotourism, Genealogy tourism, Industrial tourism, Railroad Enthusiasts, and Recreational Travelers. 5. Describe the geographic coverage. The geographic coverage includes the entire state of Hawaii. It also serves the many visitors from all over the world that come to Kauai, including the descendants of sugar plantation workers from many different countries who will have easy access to their ancestors’ history in Hawaii. The preservation of the sugar history started as a community project in 1975 when Mabel Wilcox preserved the 1864 Grove Farm plantation homestead. Grove Farm Company added to her plantation equipment collection by donating the last four surviving steam locomotives on Kauai, the first of which was restored to operating in that year. 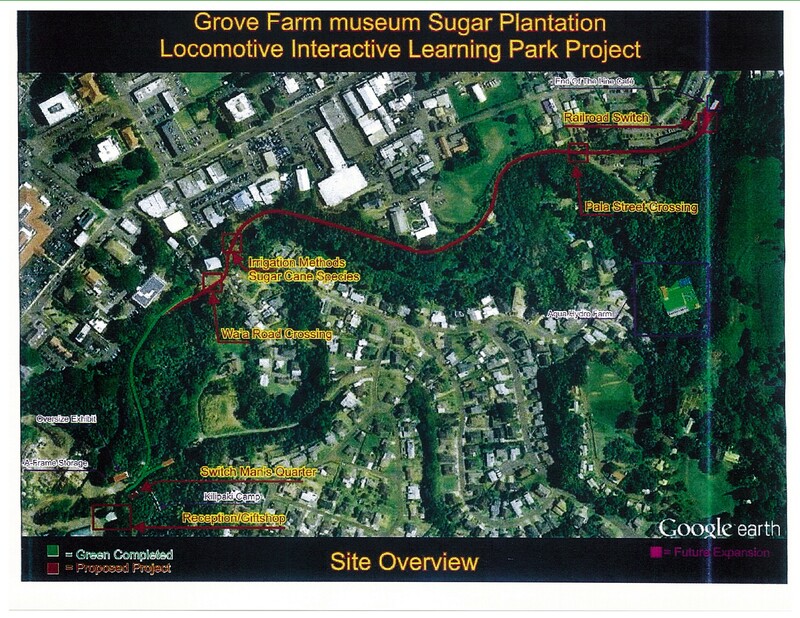 In the year 2000 when Lihue Plantation went out of sugar, Grove Farm museum purchased a seven-acre Nawiliwili Valley site located at TMK: 4-3-6-005-007 because it included a portion of the historic sugar locomotive right-of-way. For this project Grove Farm museum has raised $281,461.00 in cash and in-kind donations that have funded the purchase of 60# rail, spikes and creosoted yellow pine ties for the entire mile-long historic locomotive right-of-way, the clearing of the entire right-of-way, which was accomplished and donated by Goodfellow Bros. Inc., and the installation of 1800 feet of track. – Purchase and laying of #2 rock-ballast as a road bed for the remaining 3,500 feet of the right of way. – Installation of ties and rail on that rock-ballast road bed. – Planning approvals and permitting of infrastructure and structure. – Install water source line for water tank. – Reinforce the existing 15ft concrete support posts. – Construct the redwood tank. Quality will be evaluated through a commitment to the authenticity of the rail line extension and water tank restorations, and replication of an existing historical plantation building as the reception building. The quality assurance will be guaranteed by the experienced expertise of the rail line and construction crews. 1. The applicant shall demonstrate that it has the necessary skills, abilities, knowledge of, and experience relating to the request. State your experience and appropriateness for providing the service proposed in this application. The applicant shall also provide a listing of verifiable experience of related projects or contracts for the most recent three years that are pertinent to the request. The Grove Farm museum’s employees involved in this project have authentically restored and preserved three Kauai sugar plantation steam locomotives, and re-established two railroad lines in two locations at Puhi and Lihue on the island of Kauai. Their railroading expertise has established them as pre-eminent resources within the islands and the mainland. They have worked on locomotive restoration projects for the Alexander & Baldwin Sugar Museum on Maui, the Hawaiian Railway Society on Oahu and the Union Pacific Railroad in Cheyenne, Wyoming. These historic sites have been restored and maintained for the past 100 years to the highest standards of authenticity and detail, and are recognized nationally as models of the finest quality. 1 The applicant shall provide a description of its facilities and demonstrate its adequacy in relation to the request. If facilities are not presently available, describe plans to secure facilities. The Locomotive Learning Park is currently located within the historic corridor of Lihue across from the site of the 1842 Lihue Plantation sugar mill. Presently the locomotives are “fired-up” once a month and for school tours providing rides on 1800 feet of track. There is a temporary tent with benches for school group lectures and visitors waiting to ride. In addition to the completion of the installation of the rail line, this project will also provide for the replication of an existing historical plantation building to serve as the reception/restroom facilities as detailed in the Scope of Work above. The reception building will also provide a space for educational and community meetings. The planned construction will be ADA compliant to ensure accessibility to everyone. The applicant shall describe the proposed staffing pattern and proposed service capacity appropriate for the viability of the request. The applicant shall provide the qualifications and experience of personnel for the request and shall describe its ability to supervise, train and provide administrative direction relative to the request. Moises Madayag, Curator, is assisting with the planning and permitting portions of the project. He has been who has been with the museum for eighteen years, and his experience in caring for the sites has ensured their authenticity for the present and future generations. Scott Johnson, the museum’s Steam Locomotive Engineer will serve as the Rail Line Extension Supervisor and has over 35 years of experience with trains and railroading ranging from restoration, preservation, maintenance, operation, and education. He has done an enormous amount of research on Kauai’s railroad history and enthusiastically shares his knowledge with Kauai Elementary and Middle School students and other special groups. Harold Rosa, Sam Maehata, Oscar Gano and Brandon Fujioka who installed the initial phase of the rail line will assist in the completion of the rail line. Robert Bean and Mike Schegel the museum’s in-house preservation carpenters will serve as the historic buildings construction team. The applicant shall specify any special qualifications, including but not limited to licensure or accreditation that the applicant possesses relevant to this request. Waioli Corporation is a non-profit 501(c)(3) organization operating on the island of Kauai, State of Hawaii. Waioli Corporation was incorporated on December 17, 1974 and annually registers with the Business Division of the Department of Commerce and Consumer Affairs for the State of Hawaii. The locomotives have been listed on the national registry of historic places since 1979. Your support of this project would greatly appreciated and very valuable toward our next application in 2020. Please contact our State Legislators to let them know you support Waioli Corporation’s Locomotive Interactive Learning Park and you would like them to support it, too!